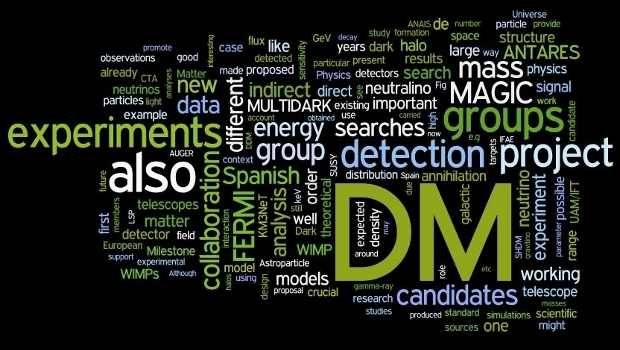 Multimessenger Approach for Dark Matter Detection (MultiDark) is a Spanish Project supported by the Consolider-Ingenio 2010 Programme of the Ministry of Economy and Competitiviness. MultiDark is funded for a period of 5 years, starting December 17, 2009. It has been extended for two more years and a half, until June 16, 2017. This COST action has begun, coordinated by Spain and where the IFIC and UIB groups of MultiDark participate. Its objective is to create interactions between phenomenologists of quantum gravity and experimentalists working on the detection of "cosmic messengers": gamma rays, neutrinos, cosmic rays and gravitational waves. Preliminary results about annual modulation of ANAIS-112 experiment led by the GIFNA group of UZ, participant in MultiDark, are cited in the news of the journal Nature. 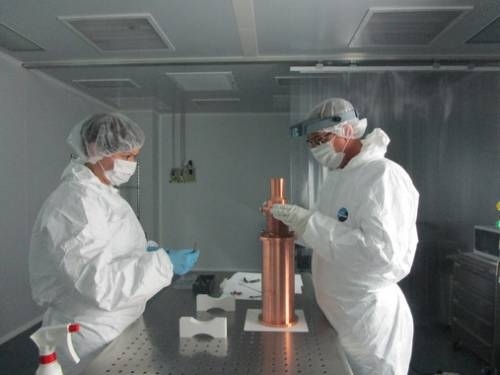 The GIFNA Group of UZ, participant in MultiDark, just publish the results of 1.5 years from ANAIS-112 experiment of direct detection of dark matter. Results are compatible with the absence of modulation and incompatible with DAMA/LIBRA signal at 90% C.L. 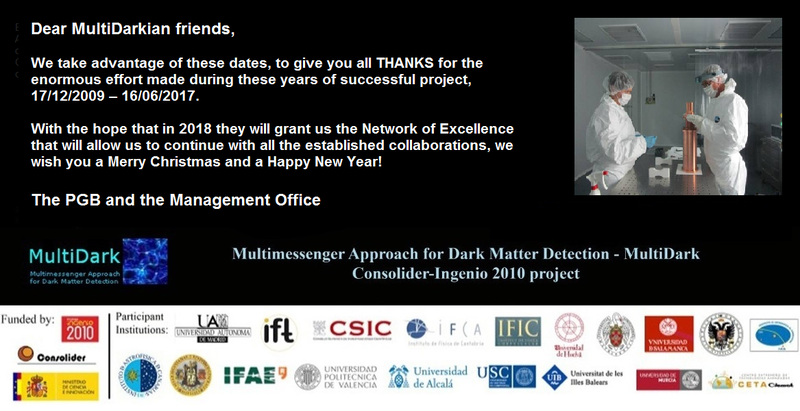 The Spanish Research Agency has approved the MultiDark Consolider Network, which will be financed for a period of 2 years from July 1, 2018 until June 30, 2020. 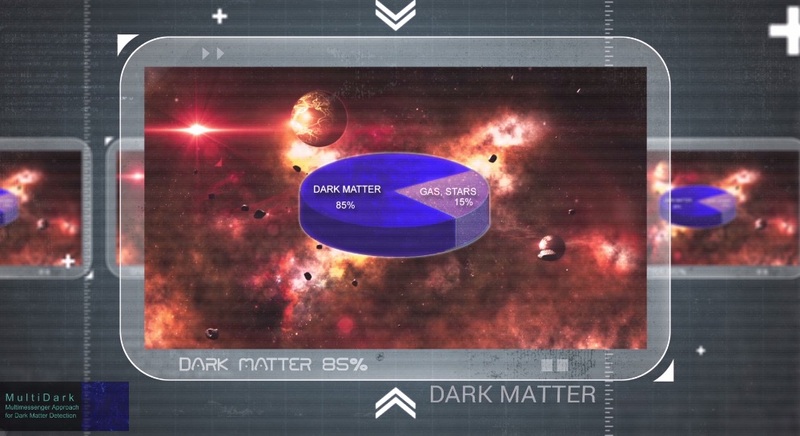 The Network will allow continuing the work of the MultiDark project, making use of the structure established during these years. Susana Hernández, MultiDark manager, has been appointed member of the Steering Committee of the Press Association in Cáceres (APC). The APC started its activity in 1965 and currently has 153 associated journalists. We take advantage of these dates, to give you all THANKS for the enormous effort made during these years of successful project, 17/12/2009 – 16/06/2017. With the hope that in 2018 they will grant us the Network of Excellence that will allow us to continue with all the established collaborations, we wish you a Merry Christmas and a Happy New Year! Un equipo internacional de astrónomos liderado desde la UAM y el IAA ha creado un modelo teórico que permite recrear la formación y evolución del universo. El trabajo proporciona un banco de pruebas sin precedentes para las nuevas teorías sobre el cosmos. This is the dawn of multimessenger astrophysics. The GRG-UIB group, led by Alicia Sintes, a member of MultiDark, participates in the LIGO Scientific Collaboration. Science with the Cherenkov Telescope Array. IFAE, UCM-GAE and UAM/IFT MultiDark groups participate in it. The GIFNA Group of UZ, participant in MultiDark, will try to confirm or refute the positive signal obtained at the LNGS in Italy. Data collection with 9 detectors, with a total weight of 112.5 kg, will be extended over a period of 2 to 5 years. 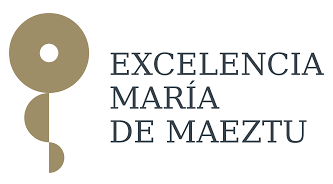 The Instituto Gallego de Física de Altas Energías (IGFAE) of the Universidad de Santiago de Compostela, participant in MultiDark, has been awarded as Unidad María de Maeztu. 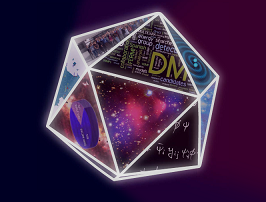 IFAE and IFT UAM-CSIC, participants in MultiDark, have renewed the Severo Ochoa award. Prof. Blas Cabrera, spokesperson of CDMS, is visiting MultiDark UAM/IFT and UZ groups. He will also give several colloquia and seminars.